obesity epidemic one beat at a time through dance! 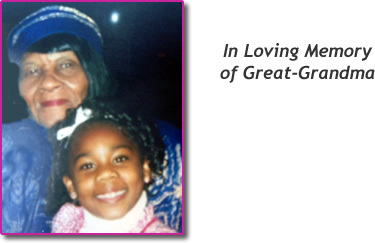 Read about how Amiya is helping fight the obesity epidemic! The Amiya Mobile Dance Academy’s (AMDA) mission is to further the art of dance in an extended cultural community which will provide dance training and community programs for all youth. This Academy plays an imperative social role using the creativity of the African American heritage along with other cultures to unite people of all races, ages, gender, and backgrounds. AMDA provides professional beginner training to young new dancers. 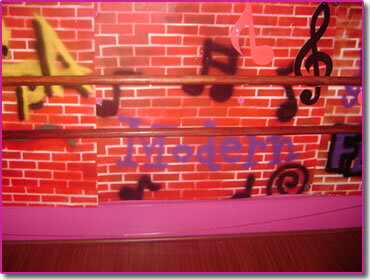 This Academy prepares new dancers with the basic skills and techniques to progress on to the next level of dance, while developing creativity, discipline, motivation, and self-confidence that all children need to conquer the challenges of today’s society. 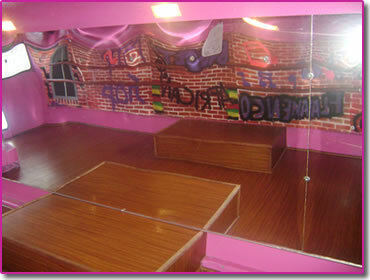 Take a peek inside the Dance Bus! Amiya's Dance Bus- Fighting the Obesity Epidemic One Beat at a Time! Did you know that between 16 and 33% of children and adolescents in America are considered obese? To put it into perspective, roughly 1 out of 3 kids in America are overweight or obese, and the figures keep on growing! The annual cost to society for obesity related conditions is over $100 billion! Not only is obesity expensive but it is life threatening. Did you know that being obese or overweight puts you at risk for developing high blood pressure, diabetes, heart failure, and other very life threatening costly conditions? YIKES! So what can we do to decrease our risk at becoming obese or overweight? Well, no matter what the ads say on TV, there is NO MAGIC PILL and it's NOT EASY, but it can be fun! The 2 most important things we can do to keep our bodies at a healthy weight are eating right and getting physical! Eating right doesn't mean giving up the things you love, but if the things you love are soda, fast food, and candy...it does mean limiting those things to just a few times a month and watching the portion sizes. To really work at good nutrition, you should check with your doctor first and ask him to refer you to a Registered Dietitian who can work with who can work with your whole family on important lifestyle changes. Now, here is the fun part...getting physical! What does that mean? Well, anything! Something as simple as walking around your neighborhood for 20 minutes every day will work. Now for adults, walking is no problem, but to a kid, this isn't a whole lot of fun. There is, however, one fun and exciting way to keep those pounds off... dancing! Dancing is not only fun to do but it's easy too! So what if you don't know HOW to dance? No problem! Did you know Michigan is one of the only states in the country that has the newest dance craze? Yes... and it's right here in your back yard! 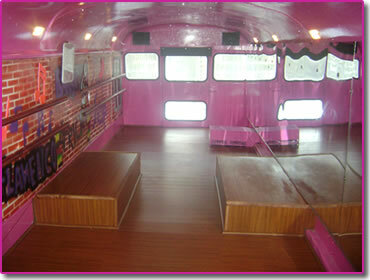 Check out Amiya's Dance Bus! This bus really moves... literally! Amiya will not only teach you how to dance and have fun doing it, but you will also be on your way to a healthier lifestyle too! Amiya teaches her students on a mobile bus! This bus really rocks! It's outfitted with the latest sound system and has a dance floor right in the bus! You will have so much fun... you won't even realize you are "working out"!